Home Journal Entries What is the Journal Entry for Carriage Outwards? Carriage outwards is essentially the delivery expense related to selling of goods. Usually it is an expense for the seller and is charged as a revenue expenditure with the help of a journal entry for carriage outwards. The product may or may not be for resale, the word “Outwards” shows that the cost is incurred while the goods are being sold by the business i.e. they are going out of the business. It is also called freight-outwards or transporation-outwards. A company pays 5,000 for carriage outwards via cheque along with total sales of 1,00,000. Show the journal entry for carriage outwards. Unlike carriage inwards which is a direct expense and shown in the trading account, carriage outwards is an indirect expense and shown as an operating item in the income statement. 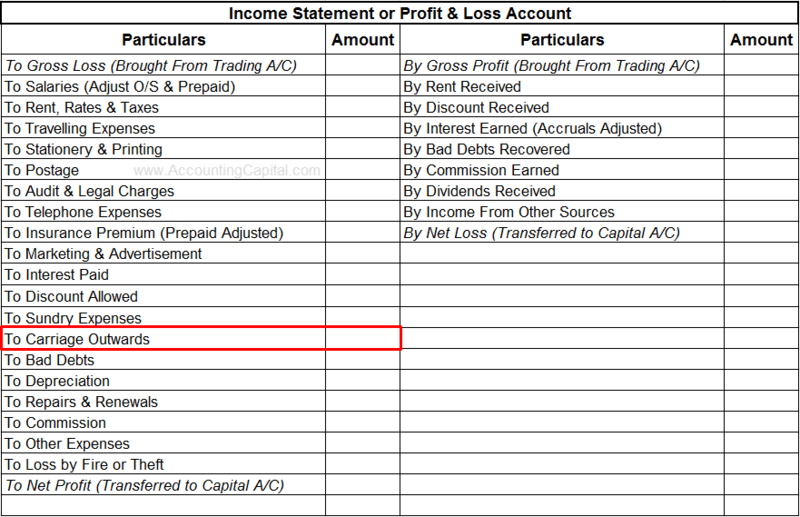 In line with the accrual method of accounting the amount of carriage outwards shown in the income statement should be related to the sales made within the same accounting period.